How to get ink out of clothes? Getting ink of clothes can be a disaster and can be difficult to get off. People send them to the laundry and if you do not want to waste money by sending to them, here are some home remedies you can try that will surely work. Step 1: You will need to start as soon as you notice the ink in your clothes. You will need two small towel that are clean and soft preferably white or light yellow in color. Start by keeping the cloth on a plain surface like a table. Keep one cloth under the ink mark and use the other one to get as much as you can off it by simply dabbing it. Do not be too hard on it. Simply wipe it so that the cloth can soak the ink while it is still wet. Step 2: If that did not work or you do not have light colored clothing at hand, you can always get wet wipes from the nearest store or at home. Wipe of the ink gently with the moist wipes and it is supposed to take off a lot of the ink by now if the ink is still wet and you acted fast. Step 3: Spray the spot with the hair spray and wipe off with the cloth or wet wipes and then take slightly warm water and mix it with dishwashing liquid and wipe off with that. Do this until all the ink disappears or at least most of it goes away. Step 4: Get a bowl of milk and dip the part of the cloth that has the ink inside that bowl. Make sure that your ink mark is soaked in the milk. Keep it like that for an hour and a half and after that you need to make a paste. Mix equal amounts of corn starch and white vinegar in another bowl and put the paste on the spot where the ink is. You should wait while the paste is drying over the ink mark. Now, the old toothbrush is going to help by getting the paste away. 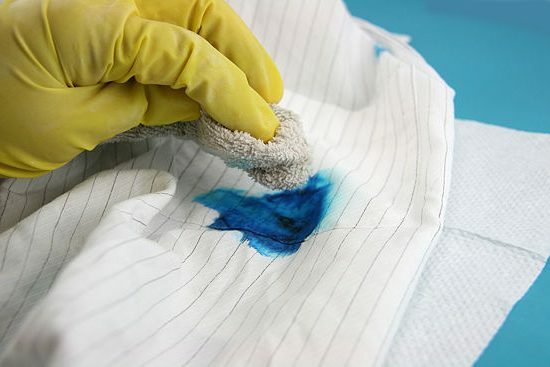 Put that particular area of clothing under running water and scrub off the paste with the brush. Step 5: Get the denatured alcohol on the cloth and wipe off the ink until no ink comes off. Lastly, put it in the washing machine. If it comes with a tag, follow the washing instructions on it. If it says to wash by hand, then do that. • Before you opt for a professional, try this to save money. • It is not necessary to put the alcohol; you can skip that step if the above steps work for you.